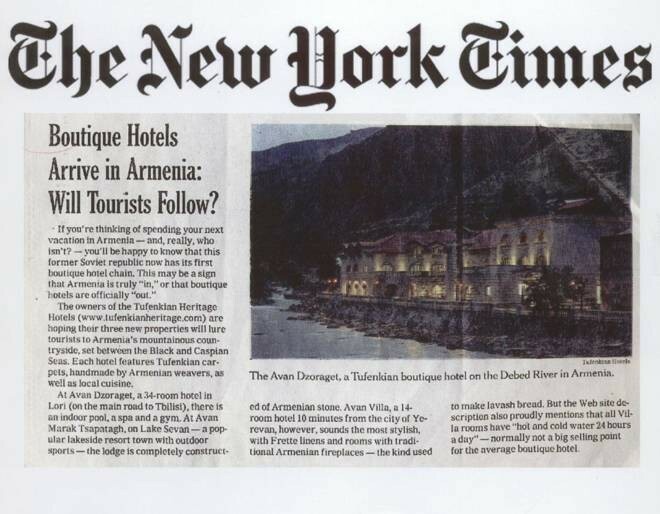 Boutique Hotels Arrive in Armenia: Will Tourists Follow? If you are thinking of spending your next vacation in Armenia- and, really who isn’t?-you’ll be happy to know that this former Soviet republic now has its first boutique hotel chain. This may be a sign that Armenia is truly ‘in’, or that boutique hotels are officially “out’. The owners of the Tufenkian Heritage Hotels (www.tufenkianheritage.com) are hoping their three new properties will lure tourists to Armenia’s mountainous countryside , set between the Black and Caspian seas. Each hotel featured Tufenkian carpets, handmade by Armenian weavers, a well as local cuisine. At Avan dzoraget, a 34 room hotel in Lori (on the main road to Tbilisi) there is an indoor pool, a spa and a gym. At Avan Marak Tsapatagh, on Lake Sevan –a popular lakeside resort town with outdoor sports-the lodge is completely constructed of Armenian stone. Avan Villa, a 14-room hotel within 10 minutes from city of Yerevan, however, sounds the most stylish, with Frette linens and rooms with traditional Armenian fireplaces-the kind used to make lavash bread.